Once again I find myself going fifties-retro as I venture into the beautiful country of Switzerland. There are virtually thousands of wonderful dishes, desserts and pastries to choose from, but as with Sweden, I have an emotional attachment to one particular famous Swiss dish: fondue. Not only did my Mom used to make it for us on a fairly regular basis -just for fun, and not just for parties - but she passed her beautiful copper fondue set on to me. I have to admit, that it's been in my attic for about 18 years - seriously. Last night I climbed over a perilously mountainous pile of boxes of books, Christmas ornaments, old chairs and a doll house to get to it. A little - okay, a lot of elbow grease and copper polish later, and my Mom's fondue set was gleaming and ready to go. The recipe below comes from Simply Recipes, a wonderful website with loads of very good recipes and useful information. Check it out! 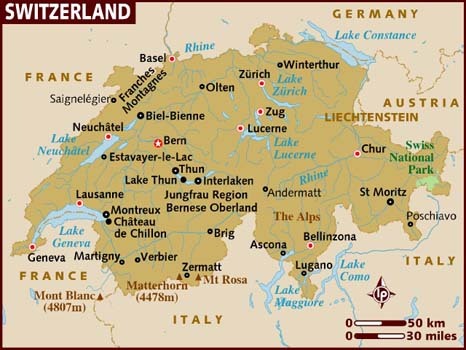 A landlocked country in Western Europe, Switzerland is bordered by Germany, France, Italy, Austria and Liechtenstein. Beginning in the 13th century, small villages began to form around Lake Lucerne. By 1798, conquest by Napoleon put an end to the Old Confederation, and by 1848, a democratic Federal state with 26 sovereign cantons, democratically elected authorities, a two chamber system, and equality of the four languages (German, French, Italian and Romansh, plus many dialects) of the country and cultures was established. This beautiful, peaceful country is home numerous symphonies, orchestras, operas and theaters. Music festivals abound, and museums, castles, mansion, churches and monasteries make for a rich cultural climate. Most notable, is Switzerland's history of neutrality. In fact, it has not been to war since 1815, and today, is a leader in peace-building initiatives around the world. If they can do it, why can't we, I wonder? Food in Switzerland varies from canton to canton, but the country is known for it's wide variety of bread, dairy and of course, Swiss cheeses. Beans, carrots, cauliflower, potatoes and numerous other vegetables are grown or imported. Sausage, veal, beef, pork, chicken, turkey, potatoes, rice and pasta are also abundant. Fruits, berries and an impressive array of sweets and chocolates round out the country's cuisine. 1 Place the shredded cheese and cornstarch in a plastic freezer bag. Seal, shake to coat the cheese with flour or cornstarch. Set aside. 2 Rub the inside of a 4-quart pot with the cut garlic, then discard. Add the wine and lemon juice to the pot, and bring to a low simmer on medium heat. Bit by bit, slowly stir the cheese into the wine. Stir constantly in a zig-zag pattern to prevent the cheese from seizing and balling up. Cook just until the cheese is melted and creamy. Do not let boil. Once the mixture is smooth, stir in kirsch, mustard and nutmeg. 3 Transfer the cheese to a fondue serving pot, set over a low flame to keep warm. If your pot is thin-bottomed, a lit candle will probably do. If thick-bottomed, you can use a small Sterno. Final Assessment: What fun! This isn't the type of dish you'd serve up on a typical weekend, but for a special occasion, it's spectacular and a real treat. Love dipping oven baked stale batards into the melted cheese. We've even done the melted choc in the fondue pot! I want to try the chocolate next, but fear it could become habit forming!